This is our first week back from the holiday break. Some of us are in the grips of winter. Baby its cold out there! It seemed appropriate to go with a winter theme and cold things. I dug into my archives and brought out my version of “Don’t Fall Through the Ice”. This activity has been in the vocabulary section and there are written instructions that can be printed out under the link. I didn’t include pictures so some of you may have missed it. As they say a picture is worth a thousand words. The activity is really very simple and made from recycled materials. I get a lot of use from my coffee cans. All you need is a wide mouthed container like a coffee container, a large rubber band, paper towels, marbles, and a spinner made from a plastic lid. The spinner has the words, one, couple, few, and several. The marbles are placed in a container of water. The paper towel is stretched across the mouth of the container and held by the rubber band. 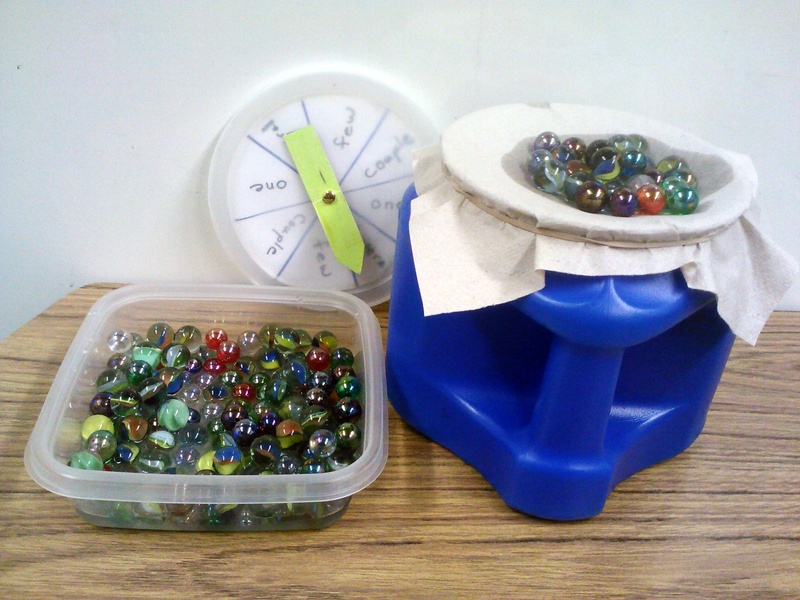 Students take turns spinning the spinner, taking the corresponding amount of marbles from the water, and placing them on top of the paper towel. Eventually the water will weaken the paper towel and the marbles will fall through. I used this activity as a reinforcement for students during therapy or as a group activity to work on the concepts of amount. I have table groups play and then compare the number of marbles they put on top before they fall through. In addition to the spinner words you can talk about the concepts of wet/dry, weak/strong, and most/ least. Augmentative and Alternative Communication, Communication board, Therapy Activities from Scratch	concept vocabulary, language activities, therapy materials from scratch. This looks fun! I know my students would have a great time trying this. Thanks for sharing.